Ritual is a clean, modern and spacious studio featuring two large rooms which facilitate Yoga, Meditation, Pilates and Barre, we are only a short walk from the beach on Palm Beach Avenue which means you can go for a dunk in the ocean after practice. Ritual was brought to life by Rose and Sophie Lamont and built with the help of many generous friends, family and other helpful souls in the community who gave up their valuable time to renovate a run down office space into a studio which is overflowing with good vibes and lots of soul. 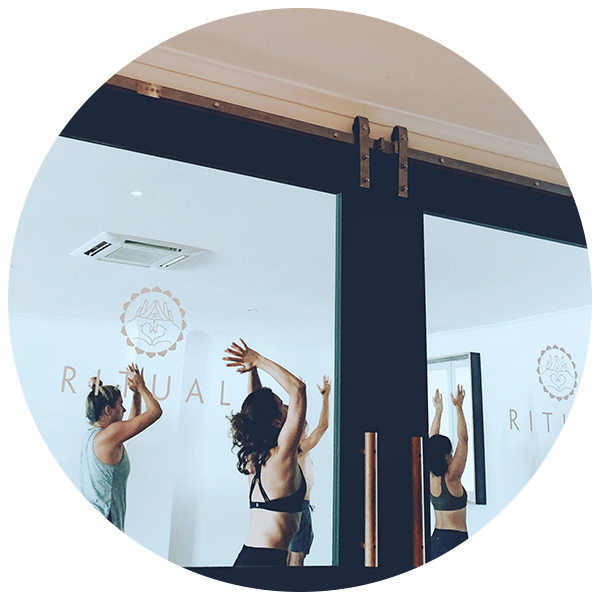 At Ritual we are dedicated to providing you with a safe, supportive and peaceful environment to practise in and our classes are facilitated by experienced and knowledgeable teachers who accomodate for all ages and fitness levels. Most importantly, we are more than simply a Yoga and Pilates studio, we are a thriving, arms wide open community made up of people of all ages and from all walks of life. Our door is always open so come in and say hello.